Moving from the Midwest to the Pacific Northwest has meant adapting to a more urban environment, and although urban density may be good for the environment, it does present a new challenge for an avid Iowa home gardener: no yard. No yard?! No problem. Intending to rise to this challenge, I am now the proud owner of a small P-Patch. So what is a P-Patch, you may ask? A P-Patch is a small plot of land rented out to urban gardeners, part of the community garden system of the greater Seattle Metro area. The "P" in P-Patch is in commemoration of the Picardo family, who donated the first plot of land from their farm to be used as a community garden back in 1973. Today the 88 individual patches in the program total up to 32 acres of land distributed throughout the city. This is a picture of my first visit to plot #203, it was a weedy, gritty mess. My very own P-Patch dog tag, plot #203. The Sunset Walk Community Garden, where my P-Patch is located, has breathtaking views of Tiger Mountain in the distance. Most people use the P-patches to grow edibles, but I will be using mine to grow stock plants for my front porch container garden, as well as for fresh cut flowers. I also want to use it as an experimental patch to grow plants from this climate, and to learn how more familiar plants behave differently in the Seattle weather. The first order of business was amending the patch's growing media. The original soil was very sandy, which meant it had good drainage but lacked in water retention. It was also lacking in organic material, which meant it likely would not contain the nutrient profile required by most of the plants I wanted to grow. Original P-Patch growing media. As you can see the soil is very sandy and loose, in contrast with the heavy clay soil I had in my Iowa garden. A good soil loam will have a balance between sand, clay, and silt. An easy way to test your soil's texture is to wet the soil, then try to make a ball with your fist. If it falls apart, you have sand. If it sticks together, you have clay. Compost is truly the miracle cure for all soil texture and nutrient problems. It will help drain a clayey soil, retain moisture in a sandy soil, and provide organic matter that can be taken up by plants as fertilizer over time. One of the great things about using compost is that it addresses both soil texture and fertilizer needs in a single, non-chemical, organic, solution. It is best to make your own, or use local compost when available. My new local compost is Cedar Grove Compost, which has a regional collection program that collects compostable material from homes and local businesses. This means it will have a good mix of yard waste as well as kitchen waste, which will give me a good Carbon to Nitrogen (C:N) ratio to support healthy plant growth. Next time you feel the need to fertilize your plants or amend your soil, put aside the miracle-gro and think compost first! A few days ago, I packed my bags to leave the Midwest and head to the Northwest coast, leaving behind my first garden. I imagine leaving behind your first garden is difficult no matter what the time of year, yet it seemed particularly heart-breaking to leave during early spring. After the long, cold, winter months, watching my mature garden slowly spring into life made this my favorite time of year. As I shut the garden gate, the flower buds are swelling beautifully, but I will be gone before I get to see the blooms one last time. I take solace in the hope that most of the plants will be at the peak of their bloom as the new owners move into the property, so that perhaps they might learn to love each specimen as much as I did. Salvia nemerosa 'Machnight' first flower buds of the season emerge. This tiny bud will grow to be about a foot tall at full maturity. Lush foliage will give way to beautiful blooms later this year. This vine will cover our provacy fence quickly and provide a true screen from our neighbors. The first year of planting the leaves were only about 2 inches across. Now on its 4th year these beautiful serrate, palmate leaves measure close to 4 inches. These beautiful swelling flower buds will bloom in about two weeks. A more recent addition to my garden, this Tiger-Eyes sumac's shoots unfurl beautifully in the spring. I planted 15 in the Fall...I guess the rest are sleeping in? Autumn Joy mixed with other cultivars gifted to me by neighbors. The tenacity of perennials never ceases to amaze me. 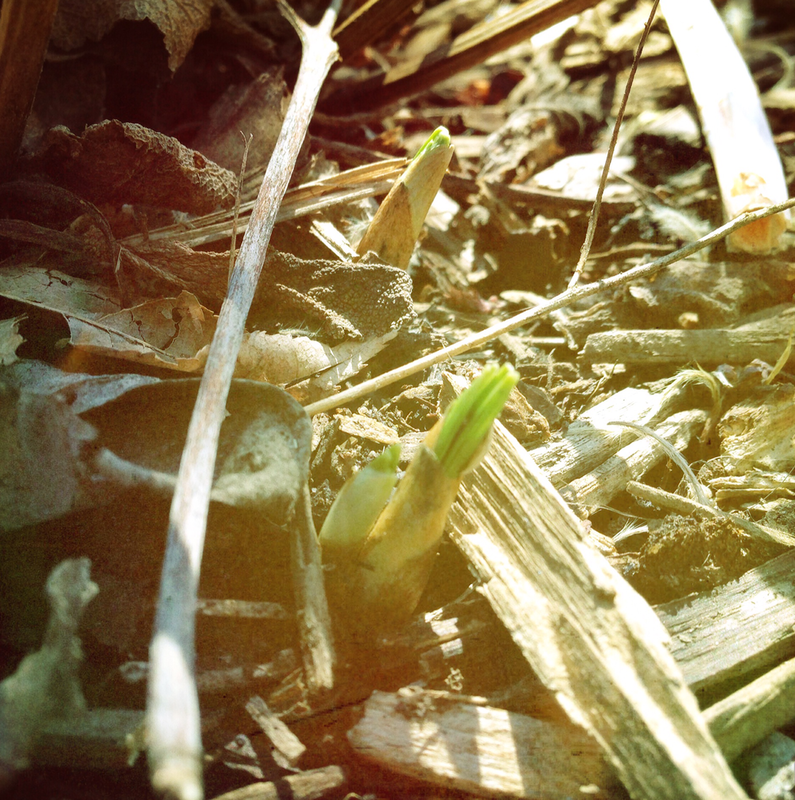 Oblivious to night-time freezing temperatures, my garden is busy sprouting on this first day of Spring.